Our house looks like a mall exploded in it, and our family has eaten itself into a stupor. That's right, it's the day after Christmas and all through the house we've all overeaten, including my spouse. Zachary spent the past two weeks memorizing each present at it appeared beneath the tree. He knew its size and location and who it came from and rejoiced as each new box appeared, even if it wasn't for him—but especiallyif it was. There was some confusion when a few packages showed up a week ago from "Santa"; we had to guess that Santa made a few "pre-trips" before Christmas Eve to homes whose trees were set up, just to save time on the Big Night. 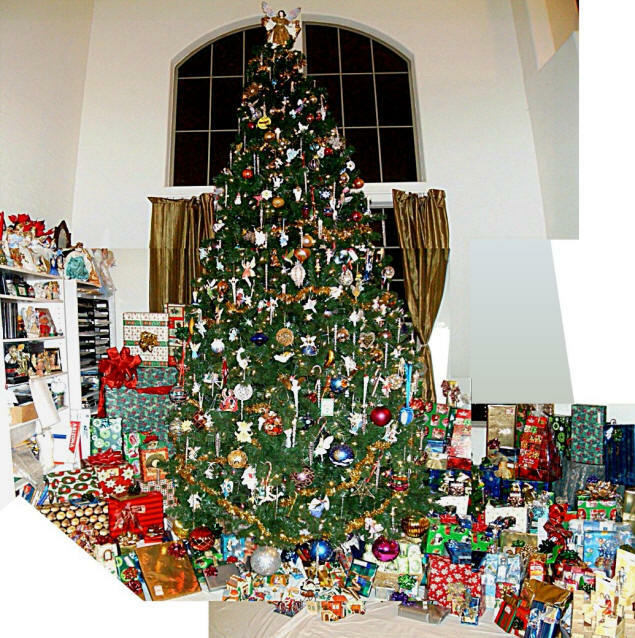 Composite view of Christmas tree and presents, such as they make with satellite views of cities. So I got into bed at 3:30…only to discover that Michael had decided to wrap presents in the bedroom while I tried to sleep. The sound of incessantly crinkling paper prevented that. "It's taking me longer because I kept the light off," he explained when I got up to move to the sofa. Sugar plums had no sooner started to dance in my head when he came downstairs to wake me up. "I'm done now," he said. So I had maybe fifteen minutes sleep before I was again awakened, this time by the central heater blasting in my face. Michael and I have the master bedroom, which wasn't optimally designed with regards to the central heating and air conditioning, perhaps because we sleep with the door closed and the thermostat is out in the upstairs hall. So in the summer we have to close the other vents and open ours; and in the winter we have to open the other vents and close ours. Except, it stayed warm so long this year that we never got around to closing our vent. So now, someone had turned on the heat to thaw out and our room was transformed into an Easy-Bake oven. So I staggered out of bed to turn down the heat—it's now 5 am—to discover that everyone else in the family was already up and sitting around the Christmas tree! "Not now! Not yet!" I pleaded and went back to bed. In what seemed like a moment, little hands were patting me on the head. "It's six o'clock, Big Papa," Zachary said softly. "Time to OPEN PRESENTS!" So I was led downstairs, where I sat down while people put packages in my lap. I may have unwrapped some of them. I have no idea what I got. But Zachary opened presents with the gusto of Cheney shredding the Constitution. He got his much-desired Xbox 360, assorted games, a free-standing basketball hoop, and even unexpected things from Santa: "How did Santa know I wanted Pirates of the Caribbean 3? It wasn't on my list! "Apparently Santa is quite the judge of character. Either that, or he had a special distribution deal with Disney. Son John showed up ahead of the other guests. His girlfriend, Rachel, was in Texas celebrating Christmas with her folks (John is flying out to join them today). He also took most of these photos, and so isn't in any of them. Sorry, John—I was half asleep! Zachary's friend, Lane, was another addition. Apparently his family celebrates on Christmas Eve, so they were just as happy to have him out of the house. The rest of our guests arrived around noon or a little before: Michael's sister, Surya, and our friends Barbara and Peter. (Peter's dad, the talented Lord of Ridley, wasn't quite feeling up to the trip, after having just played the organ for Christmas church services. He is 95, after all; and as Phyllis Diller used to say, "I bet when you're 95 you can just say, 'I'm pooped.'" Surya was easy for Peter to shop for. Jenny became official present distributor.